Hello lovers of literature wherever you are. We celebrate our shared love of reading every February. From the non-fic addict and the sci-fi fiend to the contemporary romancer in all of us, if you consume words like half-priced froyo then the second month of the calendar year is your time to shine. What better way to get your bookish booty shaking than by participating in a blind date or two – with a book. 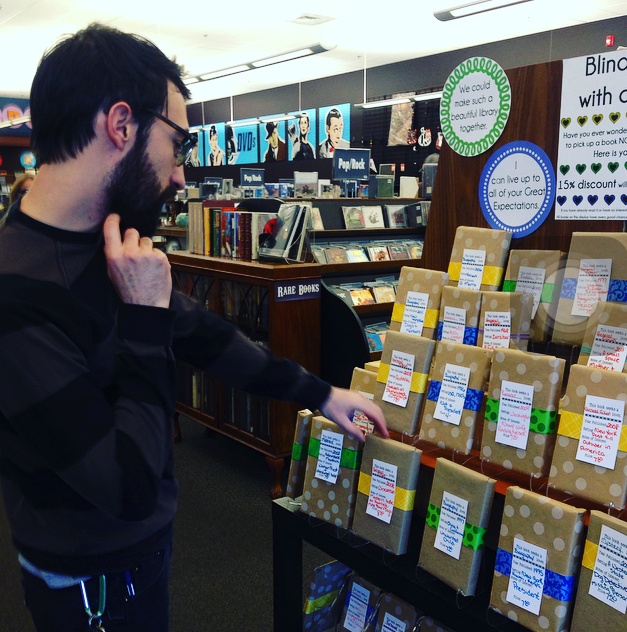 This month several Bookmans locations ask customers to take a chance on love with our Blind Date With A Book displays. Our Blind Date Books produce lovey dovey reading eyes galore. Don’t believe us? Just read these three totally true love stories that took place at our Blind Date With a Book display at Bookmans Flagstaff. It is a cold winter’s day when True Crime fan Rhea happens upon an inviting display. Never before has a bookstore sent shivers down her spine through visual merchandising alone. Completely covered, the books leave much to the imagination. Could this simple description written neatly on the wrapper be enough to form a perfect match? Rhea finds herself perusing the display. Literally unable to judge a book by its cover, Rhea worries that this blind date may turn out to be a dud. She summons her courage and picks a book wrapped in brown polka dot paper with a green ribbon. Biography, it states. Set in San Francisco, it adds. The price is $7.50 with 15% percent off. Rhea quickly purchases her blind date and decides on a warm cup of tea from the cafe as she dives in to this new adventure. Robert is in a reading rut. He tries, but he can’t find a book to keep his attention for more than a hundred pages. His friends and family take notice, suggesting books they like or hear good things about. Still, Robert continues to be unable to find a genre to pique his interest. “You’re too picky!” says his mother. Robert knows the perfect book is out there. He has to be patient. One day, while checking out the new vinyl at Bookmans Flagstaff, Robert sees a small group surrounding a book display. Everyone seems enthralled by these books. Each one precariously placed and wearing brown wrapping paper. Robert holds back, too nervous to go in and too curious to leave. “They’ve got a return policy and I’ve got trade credit,” he thinks. “If this date doesn’t work out, I can return the book and buy that guitar pedal instead.” Robert grabs a book without reading the description. He is all in. Robert finishes the book, from revealed cover to cover, in just 2 days. Robert is out of his rut! 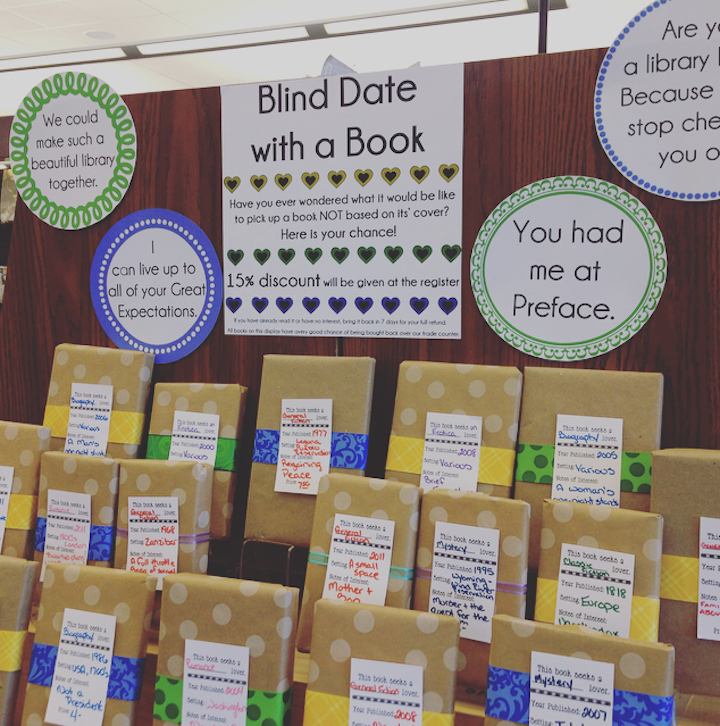 For the every day bibliophile, a Blind Date With a Book display isn’t all that innovative. Angi has partaken in such an endeavor several times. Not all are winners but, hey, you’ve got to read a few fluffy best sellers before you find a Pulitzer. Angi knows this and she goes for the Blind Date With A Book display the moment she notices it. 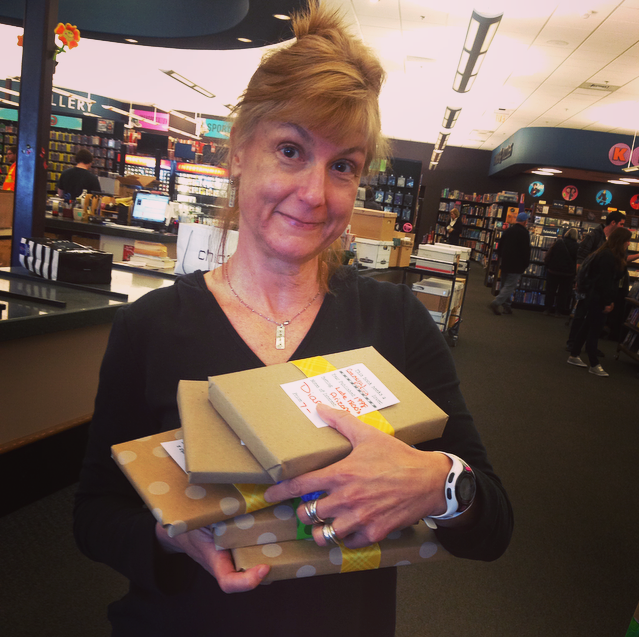 She’s no stranger to going with her gut when picking out her next read, Angi reads each description carefully. Would it be general fiction, romance, young adult or something of the non-fiction variety like true adventure? None suit her fancy at the moment – except maybe the pure mystery of not knowing what amazing book she’ll dive into. Published in 1997 and set in Sweden, this novel may be the right fit. Confidently, Angi makes her purchase and takes the book home before revealing the title. She unwraps the mysterious mystery and finds her comfiest chair. Angi starts the potential addition to her book collection. This blind date is a dud. Angi can’t bring herself to move past the first chapter. Bookmans feels her pain over the disappointing blind date. Angi trades in the mystery for a Melanie Benjamin book she’s dying to read. Not all blind dates work out, but it is worth the risk when seeking your next great literary love. Bookmans’ Blind Date With a Book displays will be available at each of these stores on specific dates – update to come! We hope you meet that special book. Happy Love of Reading Month! Use #bestdateever and tell us whether you swiped right or left on your booky date.